Sewing machine quilting has allowed the quilter’s imagination to soar. The time that it takes to complete a quilt has been cut drastically, and the number of quilt designs that one can sew is almost endless. Using this equipment makes it very easy to complete a quilt in as little time as a weekend, if that is your goal. They come with extension tables that add on to expand the surface area that holds the quilt. If there is a cabinet with an area that recesses the equipment into the cabinet, creating a sewing surface that is even with the table top, then the surface area for the quilt is even bigger. 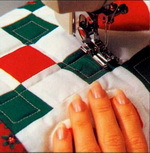 There are special feet such as the ¼ inch foot which is designed for piecing of the quilt. 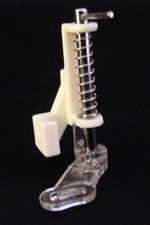 The walking foot also known as the even feed foot is actually designed to feed a large quilt such as a bed sized quilt evenly during quilting, since there are feed dogs below the quilt and feed dogs above the quilt provided by the walking foot. This makes for an easier progression of a heavy quilt during quilting, alleviating much of the drag from such a heavy object as a larger quilt. For free motion quilting the darning foot normally used in embroidery comes in handy, allowing one to stipple designs on the quilt to mimic the quilting that a longarm can do. Another useful attachment is a quilting guide. The guide is a bar made of metal that fits into a slot in the back of the presser foot and works with the presser foot during sewing. The guide rests on the fabric and makes it possible to create uniformly spaced lines of stitching during sewing. Many of the best learning tools for sewing machine quilting are actually in books. Here are a few useful references. There are many more books out there on the subject to choose from. I also found these at amazon.com, along with a number of DVDs. With the advent of sewing machine quilting, this is an art form that has become a lot more creative and a lot more fun. This is an art form that anyone can indeed learn.